Based on an ethnographic comparison between a US clinic and a French clinic, both specialized in the diagnosis of neurodegenerative diseases, this article describes two different understandings of the pathology of the social brain. From the diagnosis of frontotemporal dementia (FTD), I describe the variabilities in local knowledge and practices, and I analyze the relationships they have to different historicities and to an assemblage of judgements and values connected to ideas about the social being. I first describe how the neurologists in the American clinic highlight the loss of emotion, care, and empathy in FTD symptomatology, whereas in the French clinic, it is the loss of motivation, will and élan vital which particularly catches their attention. I further inquire into how these two 'clinical styles' are historically connected to specific modes of description of the frontal lobe pathology, which outline and presuppose particular figures of the social and of the individual: one, in the American context, that indexes a valorization of social mimetism, whereas the other, in the French context, is guided by a desire for freedom and resistance. Yeah, I always wanted to understand what makes people human; I love to think about the complicated stuff. It always frustrated me when I was in college when someone asked: ‘How does our brain do empathy?’ ‘How does our brain do creativity?’ You know, some complicated thing and nobody would really know. There’s been a lot that came out since then in neuroscience; we learned so much the last 20–30 years. But I still think we’re bad about putting the pieces together: I think we have a lot trees, the forest is not really clear, and I really want to be a part of seeing the big picture. Nicole, a neuropsychologist, at the Memory Clinic. My deepest thanks to the patients and to the medical team at the Memory Clinic without whom this work could not have come into being. I am indebted to the Wenner Gren foundation for anthropological research and to the Fondation Plan Alzheimer for supporting this inquiry. 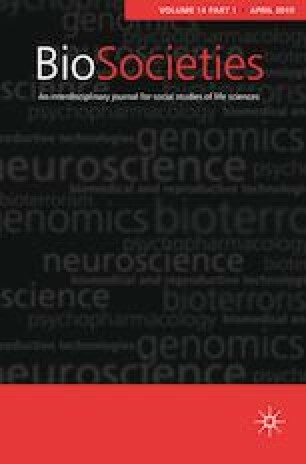 I am also grateful to Anthony Stavrianakis, Bharat Venkat, and three anonymous reviewers at BioSocieties, for their criticisms and suggestions. This study is subjected to ethical review. Heilman, K., F. Boller, and A. Damasio. N.d. History of the Society for Behavioral and Cognitive Neurology. http://the-sbcn.org/1743.cfm, accessed June 5th 2016.